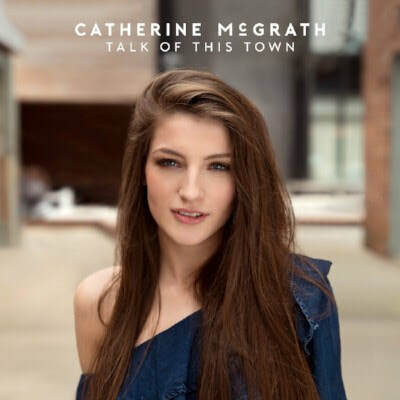 At the age of just 21, County Down native, Catherine McGrath is set to take the next step in her music career as she marks her major label debut with the new album, Talk of This Town. It's been two years now since McGrath signed a record debut with Warner Brothers and, in that time, released the four track EP - One - which was then followed last year with the five track EP, Starting From Now. McGrath has been building a reputation for herself across the UK and Europe as well as in Nashville. The 13 track album opens with the title track, Talk of This Town, which was also the first song released from the album almost a year ago now in September 2017. Having grown up in a small town in Northern Ireland, this is a track that McGrath can show her emotion as it relates so much to her story as, with many artists, tells the tale of people not having faith in their ability and don't always agree with the decision to chase a dream. Fortunately for McGrath, she gets the last laugh as she is truly now the talk of the town, if not the whole of the country. After the feel good opener, The Edges, is the love tale where two people being together completes the puzzle. The next four tracks, Lost In The Middle, Wild, Thought It Was Gonna Be Me and Don't Let Me Forget, have all been shared with fans over recent months in the build up to the eagerly awaited release date. Lost In The Middle, is about hearing a country song that makes you think of good times. Wild has an early Taylor Swift love story sound to it while Thought It Was Gonna Be Me tells the tale of waiting for someone special to come back to town only to have your heart broken when they turn up with their new love. McGrath has shown her ever growing reputation on this album by bringing in Hunter Hayes to feature on Don't Let Me Forget. As we reach the halfway point it is all new music from now on in. Enough For You is about realising you have been changing yourself to suit someone's wishes rather than being able to be yourself and shine. Dodged A Bullet shows the mixed emotions of being out of a not always perfect relationship which you should be happy to be out of, but it still hurts. Good At Love brings back the positive vibes as you look to ensure you put worries to one side to make the most of the good times. Have you ever gone to your partners staff party and wondered what on earth you're doing there? Cinderella, is the tale of being at a party you don't feel like you belong at. For McGrath, however, this is the party that starts the romance and allows dreams to come true. As the album approaches it's conclusion, Just In Case wants to live for the moment while Good Goodbyes puts a positive spin on the heartbreak goodbye tale as you now feel you've been set free. For the final track, She'll Never Love You, McGrath ensures a former flame knows what they have let go as things may never be as good for them again. McGrath has released this album at the perfect time in her career as she looks to be the first UK solo artist to hit the heights in the country charts both sides of the Atlantic. The album allows her to show her vocal strengths whilst still being able to perform storytelling lyrics that UK fans have shown their admiration for and will no doubt hang on to every word. The mix of songs will ensure many listeners can relate to the lyrics in what is sure to be a breakthrough album and the start of things to come for the Irish singer.